RYAN SIDEBOTTOM is determined to sign off a glittering 20-year career on a perfect high by lifting more silverware with his beloved Yorkshire. The 39-year-old pace bowler has today announced his intention to call it a day at the end of the forthcoming season. Since his first-class debut at Headingley back in 1997, the father of two has gone on to create a remarkable success story for himself, winning a World Twenty20 title with England, as well as five County Championship titles, including three with Yorkshire. Having taken more than 1,000 career wickets, Sidebottom admits the last few weeks of the 2017 campaign will prove emotional for him before he moves on to focus his attention on his cricket academies and a foundation that offers free coaching sessions for disadvantaged children across the county. “I love this sport, it has given me so much pleasure over the years,” said Sidebottom. “Growing up at school, when you start out playing cricket, you have two things you want to do. One is to play for Yorkshire and the other is playing for your country. To have been able to do both makes me very proud. After winning his first Championship title with Yorkshire back in 2001, the left-armer was on his way to Nottinghamshire two years later where, after helping them to promotion, he lifted his second four-day title in 2005. It was during his time at Trent Bridge that Sidebottom enjoyed the most fruitful spell of his international career, his one previous Test cap coming against Pakistan in 2001. Once recalled by Peter Moores in 2007, Sidebottom became an integral part of the England set-up, particularly in the limited overs formats where he played a vital role in clinching the 2010 Twenty20 World Cup in the Caribbean. Later that year he announced his retirement from international cricket and helped Nottinghamshire to a second Championship success before returning to where it all started. Since then he has gone on to defy expectations, his remarkable longevity seeing him take 262 first-class wickets at an average of 21.04. After being welcomed by a painful 2011 Championship relegation in his first year back at Headingley, Sidebottom proved instrumental in securing an instant return to the top tier for Yorkshire under new first-team coach Jason Gillespie. Runners-up to Durham in their first year back in Division One, two title successes in as many years followed before last season’s dramatic final day at Lord’s that saw them denied a third straight triumph by eventual champions Middlesex. The pain of that day is what is driving Sidebottom on to finish his career in the most fitting way. 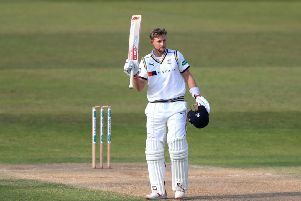 “First and foremost I’m really focused on this year, going out with a bang and trying to win another trophy for Yorkshire,” said Sidebottom.“ We came so close as a team last year in all formats, reaching two semi-finals and then taking it to the very last day in the Championship when we probably hadn’t played great cricket as a team. Martyn Moxon, Yorkshire’s director of cricket, said Sidebottom had been a fantastic servant to the game and would be sorely missed.